Grabbing the attention of mortgage professionals was FHA's decision to adopt language from HVCC appraisal guidelines. The HVCC, which has been the subject of heated debate within the industry, was implemented by Fannie Mae and Freddie Mac on May 1, 2009. At that time the FHA decided not to adhere to the policy. This undoubtedly increased demand for FHA loan products as originators quickly learned of the multitude of problems associated with HVCC. The new requirements will prohibit any commissioned based lender staff member from ordering an FHA appraisal. FHA Appraisers are not prohibited by the lender, AMC or other third party, from recording the fee the appraiser was paid for the performance of the appraisal in the appraisal report. FHA Roster appraisers are compensated at a rate that is customary and reasonable for appraisal services performed in the market area of the property being appraised. The fee for the actual completion of an FHA appraisal may not include a fee for management of the appraisal process or any activity other than the performance of the appraisal. Any management fees charged by an AMC or other third party must be for actual services related to ordering, processing or reviewing of appraisals performed for FHA financing. AMC and other third party fees must not exceed what is customary and reasonable for such services provided in the market area of the property being appraised. Appraisers have had blinders on for way too long. It is time to open our eyes wide, keep an open mind and to truly think outside the “check” box. Most of us learned this crazy business by filling out a form.For me, it was actually preparing forms on the good old typewriter, and since clients didn’t accept White-out, if you made one mistake, you retyped the whole thing …. in my case, normally after almost completing the entire report. My education truly began when I started actually thinking, securing meaningful education and not merely form-filling thanks somewhat to George K. Cox, MAI, SRA. It’s time for all of us to step back, re-evaluate and employ a little common sense. Most preprinted forms utilize a Quantitative Appraisal Method while a Qualitative Method is more is line with how buyers really act. Paired Data Analysis: A quantitative technique is normally used to identify and measure adjustments to the sale prices or rents of comparable properties. To apply this technique, sales or rental data on nearly identical properties are analyzed to isolate a single characteristic’s effect on value or rent. Where do you get these so called adjustments? I know, I know. Paired sales, right? Let me see them. Better yet, the next time you are in the hot seat be prepared to show your paired sales analysis to the court or your state regulatory board. 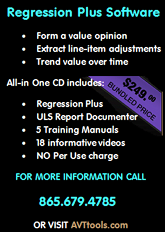 I do believe it is possible to have a proper paired sales analysis and with regression analysis becoming more and more popular there is oftentimes support for your adjustments. However, I would bet that most appraisers do not have this data in their offices to support their adjustments. Think about it! How many home buyers have you ever seen pull out a legal pad or a 1004 form and make line item adjustments for every little difference. Wait! A bathroom is worth $2,000, a garage $5,000, a deck is $2,000, etc. By the way, why don’t these numbers ever change? Buyers don’t act this way. Has anyone ever seen a buyer operate in this manner? Then why do we? Don’t buyers really analyze differences in the aggregate and make a decision in a lump sum? At the 3rd annual Association of Texas Appraisers (ATA) conference in Austin, I asked a group of 72 appraisers how many of them had ever seen buyers act this way. The answer was none! I have interviewed numerous appraisers/brokers nationwide, representing hundreds of years of experience in selling real estate and not one has seen a buyer act this way! If we are charged with analyzing the market, and market participants don’t act that way, why do we? Relative Comparison Analysis: A qualitative technique for analyzing comparable sales; used to determine whether the characteristics of a comparable property are inferior, superior, or equal to those of the subject property. Relative comparison analysis is similar to paired data analysis, but quantitative adjustments are not derived. Both methods provide support of $43,400 for the subject property. The qualitative/relative comparison analysis provides the same results without guessing for an amount of single line item adjustments. “…it became fashionable for some appraisers, with the encouragement of some public agencies, to rate the degree of variation between the subject property and comparative sales. Quantification of the variations, usually by the use of a plus or minus percentage (or dollar amount) from the comp to the subject, became the vogue. Consider analyzing property the way the market does: in a Qualitative manner. Bryan S. Reynolds is a Certified General Real Property Appraiser and an AQB Certified USPAP Instructor. Mr. Reynolds serves as an adjunct faculty member of The Columbia Institute, and is an approved appraisal instructor in 31 states.